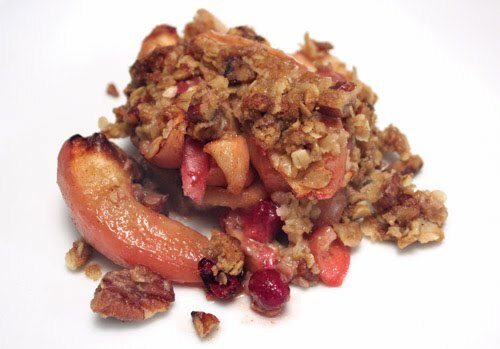 The fall meal from the ‘What’s for Dinner’ recipe cards concluded with apple cranberry crumble for dessert. While making the crumble, I realized this might be the most forgiving dessert there is. You place fruit in a baking dish and top it with a crumbly, buttery mixture. You can use a combination of fruits as was done here or you can use all of one kind. You can use a little more or a little less, and you can peel or not peel, slice or chop, mix and match as you wish. Then, the topping quantity is really just a suggestion. If you like a lot of crumble topping, you can increase the total amount and mound it over the fruit. If you prefer the dessert to be more fruit-focused, cut back on the crumble quantity for little bits of buttery crunch. It’s really all up to you, and I like that about a crumble. For this one, I used three gala apples, I left the peels on, and I sliced them. One half cup of fresh cranberries was suggested, but I used a little more than that. The fruit was tossed with sugar, cinnamon, and a pinch of salt and was placed in a buttered baking dish. 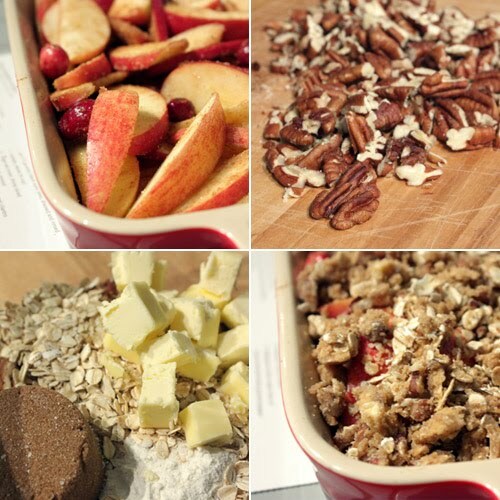 The crumble topping was made with butter, flour, oats, chopped pecans, and light-brown sugar. I went with the suggest quantities but added just a few extra pecans. The topping was sprinkled over the fruit, and the dish baked until golden for about 30 minutes. Not only is this dessert forgiving, baking this is one of the easiest ways to make your house smell amazing. I like that the apple slices have a little more texture when the peel is left intact. And, I really like the tartness of the cranberries studded throughout the dessert. 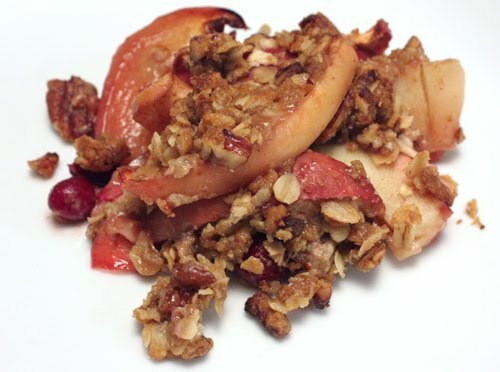 Of course, the crumble topping is what makes it what it is, and the mix of oats and chopped pecans with the cinnamon-spiced fruit is always a natural fit. Next time I might use a colorful combination of red apples and granny smiths, and I might increase the amount of cranberries even more. It’s so easy and foolproof, it makes a perfect, quick dessert for a fall meal. That crumble looks really tasty! I so love cranberry & combined with apple: that is so luscious! I would call this a crisp, but I guess other people have different names for it. Whatever it is, I want some. Linda: I was calling it a crisp too. While I was making it and talking about it, I kept saying 'crisp.' Then, when I wrote this post, I realized the recipe referred to it as crumble. This looks delish! I bet this would be great with cherries too. oh this sounds so delicious! Well. I've got some apples I need to eat, so I guess a crumble I shall turn them into to. Oooh, sweet and tart. This may be just as good as sweet and savory. Looks like a nice dish for the holidays. Looks so yummy. I love that you added pecans, I just loooove them! apples and cranberries are two of the most versatile and delicious fruits in the world, and they're both so season-appropriate! lovely crumble, and amen to leaving the peel on the apples! apple and cranberry, great combination of flavors.. This is one of my favorites! Love the apple with cranberries. The crumble topping is one of the best parts! This is a dessert that epitomizes fall if there ever was one. Love the color of it, too. I love crumbly, buttery mixture for dessert, or even as a snack! I love crumbles, crisps, etc. The tops are delicious, but they really let the fruit be the star! Apple crumble is one of my favourite desserts. Your topping with chopped pecans is adding more texture. Love it ! This does really say Fall, and I love the topping. Excellent dessert for the Fall, I have to look out for some fresh cranberry too. I love apple crisps, a comforting dessert that makes me feel all warm inside. Nothing is better that a good crisp in the Fall. Lovely one you baked. A combination of apples and cranberries sound wonderful, what a delicious crumble! Oh that looks so good! I am in the mood for something like that right now. I can just imagine how wonderful your house smelled while this yummy dessert was baking! Crisp or crumble, this has to be one of my most favorite desserts! I still have some apples from our tree; they've been stored in the garage, all forlorn and waiting for just such an opportunity to shine. I'll remember your tip to keep the peel intact! Let's just call this apple-cran deliciousness! Lisa it is after dinner here, we were just talking about a warm crisp that we could have (we have none ;-( ).. and here it is. love the cranberries here.